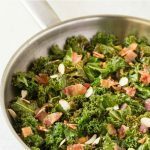 Sautéed Kale with bacon and almonds is a terrific low carb side dish that your whole family will love! 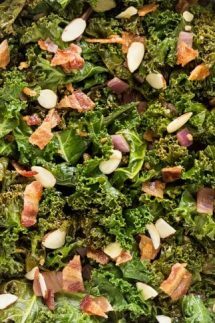 With only 3g net carbs per serving this delicious kale recipe is perfect for your low carb and keto diets, and it’s paleo and Whole30 compliant too. 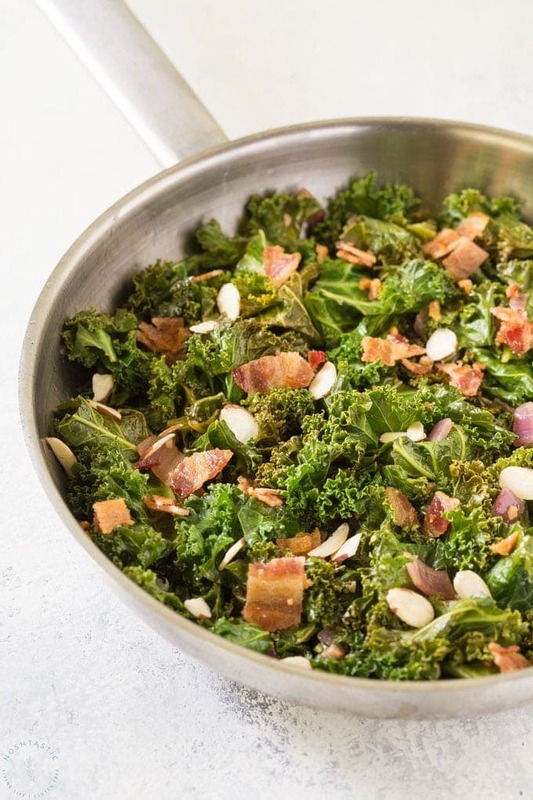 For convenience you can buy ready chopped kale in a bag, but I prefer to buy it and chop it myself to make Sautéed Kale, it’s really easy to do. Choose kale that is firm, bright green, and not floppy. If it’s overly floppy it’s older, so pick another bunch! 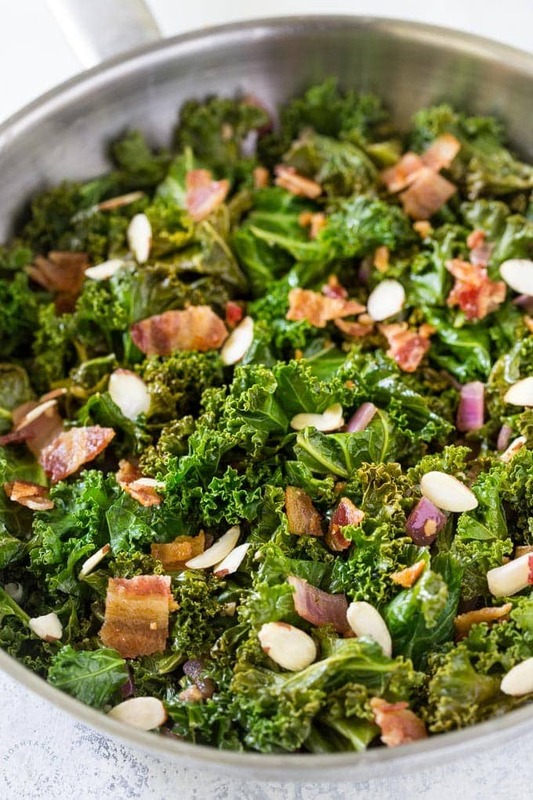 Prep and wash the kale before you start cooking, this recipe cooks fast so you need all the ingredients ready to go. This recipes uses already cooked bacon, so make sure you cook that first or simply buy ready cooked bacon. 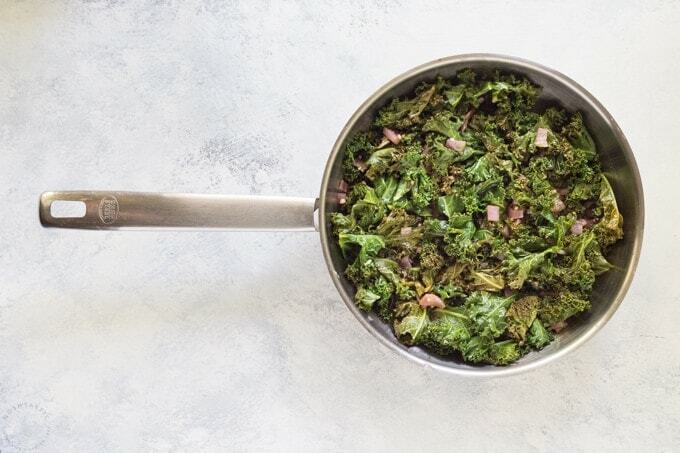 You can reheat your sauteed kale, but for best results make this recipe when you’re ready to serve it. Kale is the latest in hipster vegetables but not just because it tastes great, it also packs a nutritional punch too! It’s is a green leafy vegetable in the cabbage family (Brassica oleracea) but unlike a cabbage, the leaves don’t form a head. Kale contains high levels of potassium, which is good for supporting blood pressure, cardiovascular health, bone strength, and muscle strength. It’s also high in fiber, antioxidants, calcium, and vitamin K, and iron. You’ll need a large skillet to make this recipe, I used my stainless steel skillet but a cast iron skillet would work well too. I love this set of chopping boards as they are dishwasher proof and come in various sizes. If you’re cooking the bacon yourself rather than buying ready cooked then I urge you to get a wire rack for your sheet pan so you can cook it all in the oven and it won’t be swimming in grease! It’s very low tech but it’s one of my favorite kitchen ‘gadgets’. A healthy low carb and keto side dish you can cook in less than ten minutes, with 3 grams net carbs. Add red onions, 1-3 cloves garlic (READ RECIPE NOTES!) and cook for 2-3 minutes taking care that the garlic does not burn. Add the kale, water, Balsamic Vinegar, salt, and pepper, and stir, then turn down the heat to low, cover the pan, and cook for 5 minutes. Remove the lid and continue to cook for a few more minutes until some of the liquid has evaporated. serve hot and sprinkle with cooked crispy bacon and sliced almonds, add salt and pepper to taste. 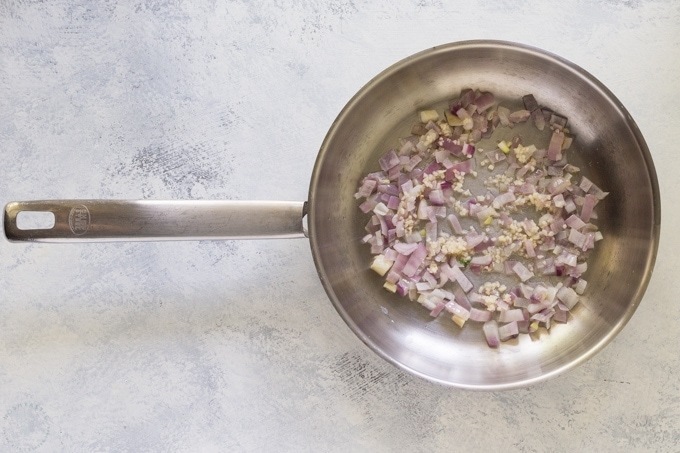 If you add two more cloves of garlic this will improve the flavor, but raise the carb count from 3g net carbs, to 4g net carbs per serving. I enjoy seeing the recipes that you share!